In my prior blog, I discussed preparing to go to Washington D.C. to advocate, and my husband Jim's meeting with Senator Claire McCaskill, where he shared our story with her and a room of 75 other Missouri constituents. As I said, Jim isn't really keen on public speaking or attention, and I am SO proud of him for advocating for Grace and families that need options like these to be available and legal. It was a huge demonstration of his love for his daughter. While Jim was doing this, I meet up with Shivana Jorawar and Carina Ahuja from the National Abortion Foundation, which is an organization that has been amazing to work with. They have helped me share our story and focus on what might be most helpful in terms of advocacy, which is something I've gotten overwhelmed with as a new advocate. 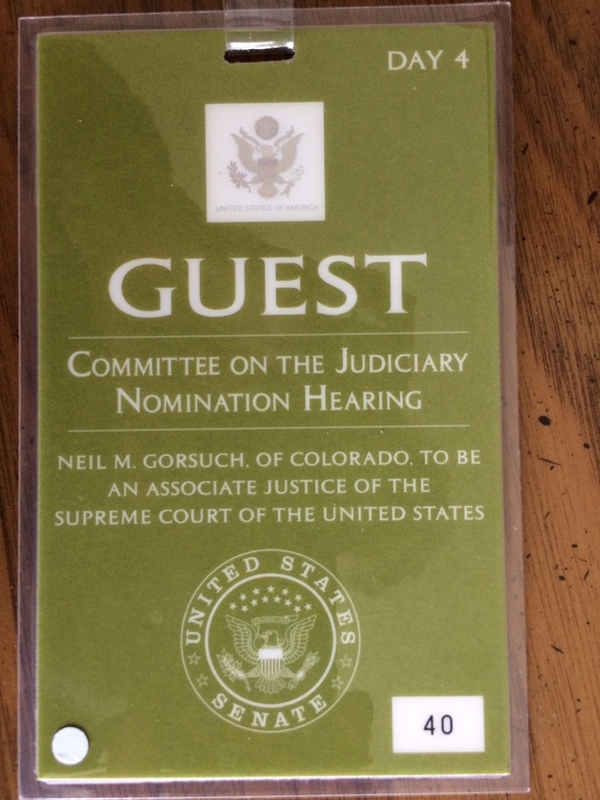 Shivana had picked up the guest passes for Judge Gorsuch's confirmation hearing, which Senator Feinstein had graciously provided, and we headed in to get settled. Professionally, I don't do anything like this in my regular day to day work (I'm a project manager) so it was amazing to personally be in the room where it happens: where such important policy and political work takes place. Right when I was finally getting settled in and used to the idea that I was going to get to watch a day of Judge Gorsuch's confirmation hearing, I was invited over to meet Senator Dianne Feinstein and Senator Chuck Grassley. What an insane honor! I will go into how I felt about the entire experience in the next blog, so I don't want to delve into it too much here, but being able to thank Senator Feinstein for having me there, and for bringing our story to the forefront was amazing. We have had so many amazing people advocate for and support us on this journey, and so rarely do we get to thank them in person. Senator Feinstein was absolutely lovely; warm and enthusiastically stating that we have to keep trying to have a family, and Senator Grassley likewise was warm, funny and very kind. It was an immense privilege and treat to meet them both, and being able to personally hand Senator Feinstein my thank you note as well as my packet of materials was such a source of pride for me. The hearing started immediately after my meeting (as you can see in the video above). I got to hear testimony on Judge Gorsuch's skillset, character, prior judgments and temperament. The wide variety of witnesses included members of the American Bar association, clerks Gorsuch has worked with, individuals who had been impacted by cases Judge Gorsuch ruled upon, and individuals representing organizations that have concerns about how Gorsuch's rulings as a Supreme Court justice might affect them, such as representatives from LGBTQ and Pro-Choice organizations. Sandy Phillips, whose daughter, Jessica, died in the Aurora, Colorado, theater massacre gave the most heart-wrenching testimony of the day, and again I was overwhelmed by how lucky I was to be in the room where such important topics were being discussed. It really hit home how real each and every issue is, and how full of gray area and nuance they all are, not just the one I personally am fighting for (reproductive rights). More on that in the next blog. The one break we took during the day was to meet with a member of Senator Claire McCaskill's Legislative Counsel to share my story and how we feel Gorsuch's confirmation may affect our legal options going forward. I was accompanied by Shivana and Carina from the NAF and Gaylynn Burroughs from the Feminist Majority Foundation, and it was so invigorating to be able to share my perspective and story with the room, and to advocate for Grace. I was able to share how heartbreaking it was to learn that our desperately wanted daughter wasn't going to survive pregnancy, our feelings that termination was our best option, and how the Missouri abortion consents made the entire process so much more difficult than it needed to be. I was also able to share that I felt compelled to advocate because of how terrified I and so many others feel right now after President Trump said he would nominate a judge that would overturn Roe v Wade. This isn't theoretical - this really affects lives in a very, very real way. It would 100% hurt Grace, in our opinion, especially since the Missouri abortion laws prove that exceptions are not put into place for very important situations like fetal anomalies. A cruel oversight at a minimum which doesn't give me comfort that our legislators will produce or pass laws that truly do want and consider the best for all of the parties that might be affected. The day was incredibly exciting, invigorating and empowering, but also very bittersweet and overwhelming. As I mentioned above, the next blog will be about how it felt to be there, and how we feel now, but it goes without saying that the day was a blend of feeling so excited that Grace is making a difference, but also overwhelmed that the people that need to care maybe don't, or that we just can't reach some people. Logically knowing that and seeing it with my own eyes are separate things. But undeniably, getting to attend Judge Gorsuch's confirmation hearing and thank Senator Feinstein in person were once in a lifetime opportunities, and a testament to how loved Grace was, continues to be, and how much she has impacted people, even though she was only part of our world for a far-too-brief time.